Two industry leaders have unveiled a partnership that promises to heavily-improved Ayala Malls Cinemas’ online movie ticket reservation and purchase website – SureSeats.com. The website, now in its 16th year of operation and a pioneer on online ticket reservations in the country, is now going to be powered by Globe Telecom’s Gmovies. The new SureSeats.com portal (currently in Beta) promises to be optimized for mobile, tablet, or desktop view. It also touts that the booking process will be streamlined through lesser clicks, faster steps, and easier access to movie schedules. Essentially, it will give moviegoers a quicker and better way of getting seats and tickets whenever and wherever. 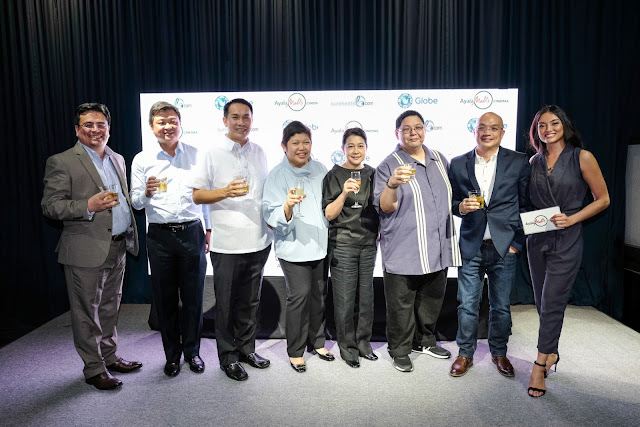 The announced revamped of the site and partnership between Ayala Malls Cinemas and Globe Telecom were celebrated with friends from the movie and media industry last March 16, 2017 in the exclusive Prohibition Lounge at Greenbelt. Ayala and Globe executives offered a toast in the unveiling of the enhanced website. In attendance were Bobby O. Dy, CEO of Ayala Land; Junie H. Jalandoni, SVP of Ayala Land and Head of Commercial Business Group; Rowena M. Tomeldan, Head of Ayala Malls; Ruby P. Chiong, CFO of Ayala Malls; Dion Asencio, Vice President for Enterprise and IT-Enabled Services Group of Globe Telecom; and Glenn Estrella, Vice President for Digital Ventures of Globe Telecom. Celebrities from the entertainment industry who graced the re-launch were: Arci Muñoz, Lauren Reid, Jack Reid, Luis Alandy, Marco Alcaraz, Joross Gamboa, Denise Laurel, Meg Imperial, Edgar Allan Guzman, Loren Burgos, Riva Quenery, Sarah Carlos, Mark Neumann, Rein Salamante, Donnalyn Bartolome, Josh Padilla, Cindy Miranda, Shy Carlos, Debbie Garcia, Phoebe Walker, Devon Seron, Miho Nashida, Mikee Agustin, Yexel Sebastian, Fourth Solomon, Fifth Solomon, Enchong Dee, LA Aguinaldo, Jodillyn Pendre, Alaiza Malinao, Miko Raval, Raphael Robes, Jane Oineza, Janeena Chan, Sonja Cali-Kakilala, power mom-daughter tandem Lily and Roselle Monteverde, Warner Bros. Philippines General Manager Francis Soliven, Keren Pascual, and Noel Ferrer. The evening continued with an exclusive movie screening of "Beauty and the Beast" at Greenbelt 3’s 4DX and all-recliner seats cinemas.